How could I not blog this? 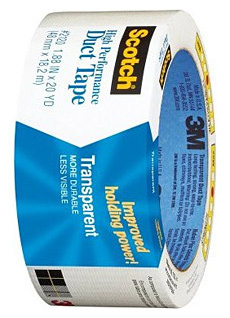 Transparent Duct Tape?! Does it get any awesomer? Is awesomer a word? Who cares! Transparent Duct Tape deserves a word unto itself, just like it deserves title case capitalization! In all seriousness though, it looks to be some pretty rockin’ stuff. With this in our pack, quick jerry-rigs will be a little less obvious and this stuff is UV resistant and lasts up to 6 times longer than it’s tired grey brethren. I guess I don’t need to ask what you want for your birthday. I don’t think I’ve seen you get that excited about anything… well, maybe… ever. Nerd. Duct tape and WD40 – two absolute necessities in life. If something is too loose and shouldn’t be, you use duct tape (now in transparent colors). If something is too tight and needs to be loosened, use WD40 (also quite transparent). I once helped a couple from Red Deer duct tape a leaky canoe on Bowron Lakes in BC. I am sure it worked but I’ve never seen or heard from them again and sometimes I wonder.